Volunteer vacations have grown in popularity over the past several decades. Today there are hundreds of opportunities to travel to nations around the globe and spend a week or two volunteering for a wide variety of good causes. While some volunteer vacations are designed for young people and families, there are many that are well-suited for retirees. There are several benefits to a volunteer vacation. There is the rewarding feeling that comes from helping the environment, animals, or people who are less fortunate. Volunteer vacations offer you the opportunity to experience a local culture in a more authentic way than you possibly could by staying at a luxury resort and only seeing famous tourist landmarks. The organizations that offer these vacations handle the planning and logistics, so there are fewer arrangements to be made by you. And since you will travel and work in a small supervised group, you will meet and work with like-minded people in a safe environment. But all volunteer vacations are not created equally. Here are eight essential tips that will help you select and prepare for a successful volunteer vacation. Be sure you understand what types of activities you will be performing, what your accommodations will be, and what is and isn’t covered in the cost. Learn how you will be assisted by local staff and what safety precautions will be taken. Contact people who have taken volunteer vacations with each company you are considering and, if possible, for the particular trip you are considering. While the company or organization will probably refer you only to people who have had positive experiences, you can still ask about the pros and cons of their experience, what they suggest could be improved and what advice they can offer. You can also use search engines to find blogs and discussion forums in which past volunteers have shared their experiences in a more unfiltered manner. GoAbroad.com and GoOverseas.com offer independent reviews from people who have participated in most volunteer programs. 3. 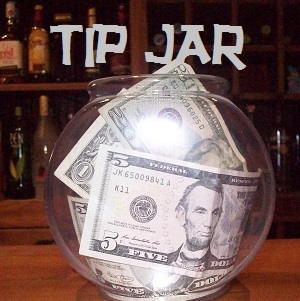 Your volunteer vacation may be tax-deductible. Some organizations who offer volunteer vacations are for-profit companies and others are non-profit organizations. Find out if the organization has been granted 501(c)3 status and consult your tax professional. 4. Non-profits aren’t necessarily better or cheaper. In both the for-profit and the non-profit sectors, there are reputable, trustworthy organizations that do a great job and there are unscrupulous operators. New companies and organizations appear every year, so it pays to research your options thoroughly. 5. Not all volunteer vacation programs are useful. Some volunteer tourism opportunities are designed primarily for the benefit of the travelers, not the local residents. Some programs may cause more harm than good. Building projects that are staffed by volunteers may be taking jobs away from local workers, who can be hired cheaply and who rely upon those wages to survive. Children in orphanages or schools may form emotional bonds with people who come to volunteer, only to suffer abandonment issues when they leave. Non-profit organizations that have formed long-term partnerships with local non-governmental organizations are most likely to do good for the local communities. 6. Understand that you will be making a limited impact. Even when you volunteer with a reputable organization, you will not be curing cancer or ending world hunger. You won’t be able to teach a student English in a few days. However, the collective impact of everyone who volunteers in any given place over the course of many years can be substantial. 7. Many volunteer vacations aren’t cheap. The fees for international destinations are often in the range of $2,000 to $4,000. It may seem odd that you are expected to pay for the privilege of volunteering, but this fee covers your accommodations, meals, an on-site support staff, ground transportation, planning, health and travel insurance, and the operating costs of the organization that is arranging the vacation. Also, consider that part of what you are getting is a vacation. Daily schedules usually include a few hours of volunteering and a few hours of sightseeing or experiencing the local culture. It helps to understand that it costs money for you to be there. Your accommodations, meals, transportation, and the support staff all cost money. While the organization you are volunteering with may be soliciting donations through other channels, those donors want to see their money going to the local people and projects, not to pay the expenses of relatively well-off people who are taking volunteer vacations. If you are concerned about the fee, ask the company or organization you are interested in volunteering with for a breakdown of how your money will be used. This information may be on their website or they should be willing to provide it for you. If they will not, consider that a red flag. 8. You don’t have to leave the United States. There are plenty of good volunteer vacation opportunities closer to home. Domestic programs tend to be much less expensive than international ones, because there are fewer logistics to deal with. For example, organizations such as the American Hiking Society and many state-based groups offer week-long hiking and backpacking trips in which participants build and maintain trails. Accommodations vary from primitive campsites to bunkhouses or cabins. Trips cost approximately $300 and are rated on a difficulty level ranging from moderate to very strenuous. A volunteer vacation can be a memorable, rewarding, and life-changing experience. But as with most other vacations, you should research your options thoroughly and prepare well in order to find an opportunity that is well-suited to you. Volunteer World is a comparison platform for international volunteer opportunities. They list over 1000 opportunities from many organizations. Individual volunteer vacation programs: Global Volunteers, Cross-Cultural Solutions Volunteer Vacations, GlobeAware, REI Volunteer Vacations, GoVoluntouring, WorldTeach. These links are offered for your convenience. 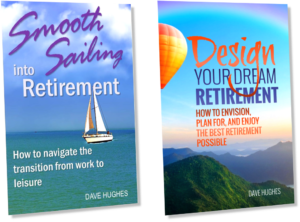 These programs have not been researched and evaluated by Retire Fabulously!, and no endorsement or guarantee is implied. Please exercise due diligence by asking questions of the organization, reading reviews, and contacting people who have participated in these programs. Retire Fabulously! did not receive any form of promotional consideration from any of these organizations. 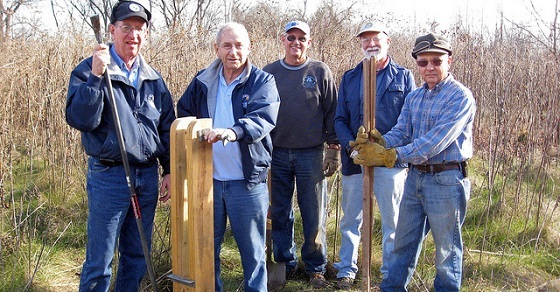 Men volunteering outdoors: U.S. Fish and Wildlife Service. Some rights reserved. 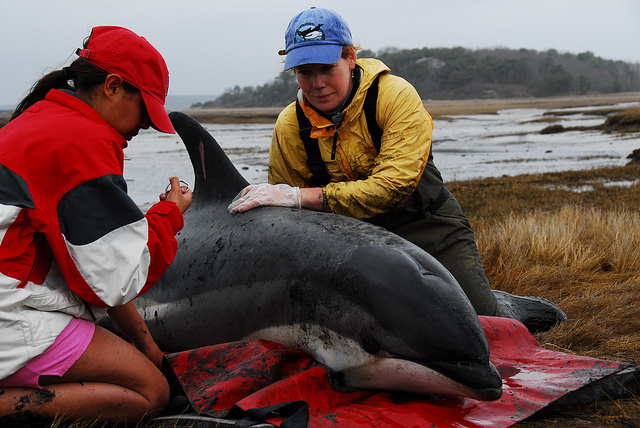 Volunteers monitoring a dolphin: International Fund for Animal Welfare. Some rights reserved. 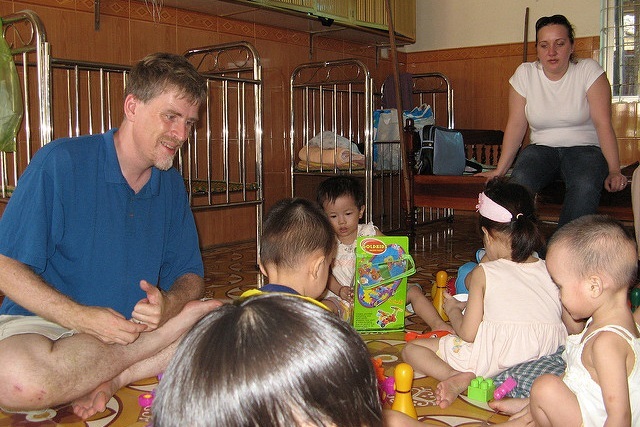 Volunteers in an orphanage: William Whyte. Some rights reserved. 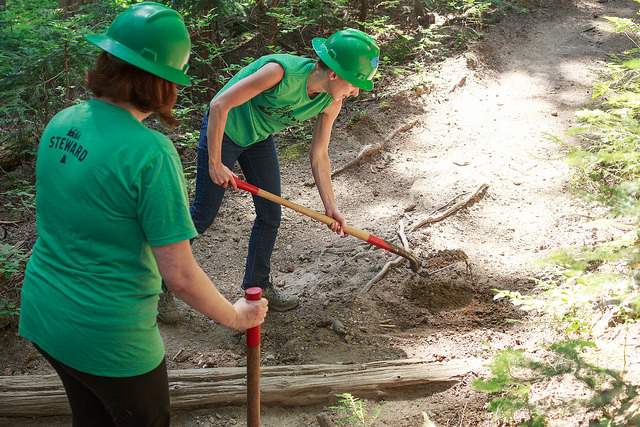 Volunteers maintaining a trail: Mount Rainier National Park. Some rights reserved.